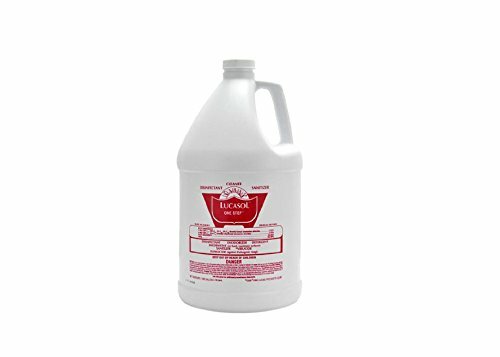 LUCASOL One Step brand Deodorizing Disinfectant Cleaner - Best selling sunbed disinfectant in America. Mix two ounces per gallon of water to kill staph, strep, cold, flu, mono, HIV, herpes, foot fungus, and more. 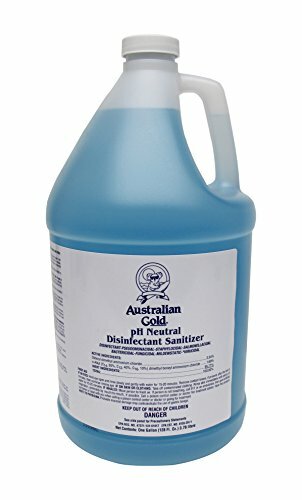 See label for details. No rinse required. Safe for sunbed acrylic. Great starter kit when buying a new sun bed or just to freshen up your current tanning unit. 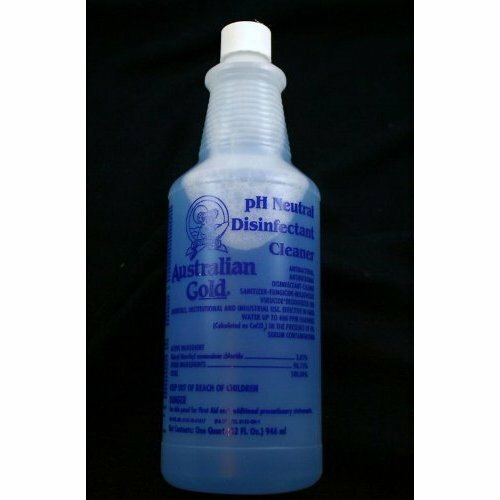 Sanitizer Concentrate makes up to 16 Gallons of tanning bed acrylic cleaner. 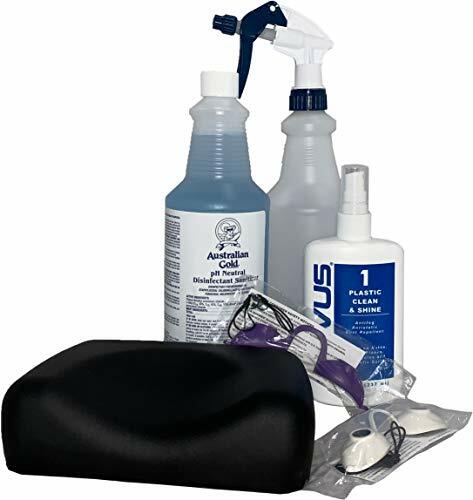 The Novus Acrylic Polish is used to clean, repel dust, eliminate static, and leaves a lustrous shine. The Closed Cell Foam tanning pillow is easy to clean & resist stains from make-up or lotions. 2 pairs of Peepers UV Eye Protection with removable elastic sting have a raised nose bridge for no tan lines. This bundle includes one (1 gallon) Lucasol One Step formula and one (24 oz.) Lucasol XTRA-LIFE sprayer. 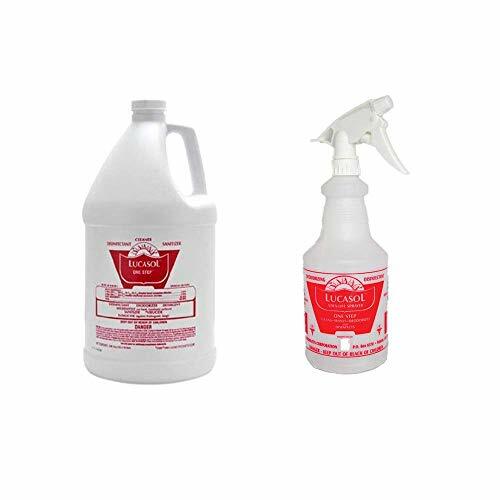 With Lucasol One Step cleaner, the fear and guesswork is taken out of assuring that your home or business is sanitized and disinfected from germs and viruses. 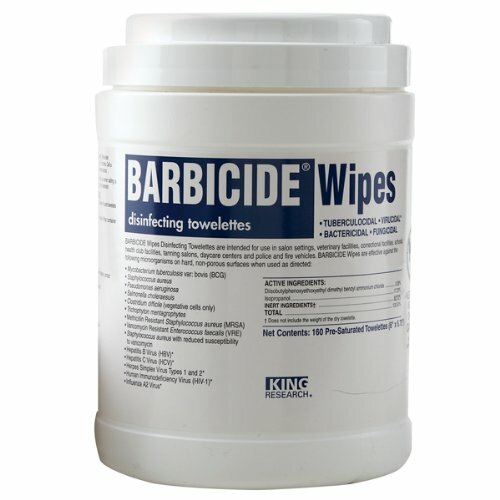 This product is formulated to disinfect inanimate, hard non-porous surfaces: floors, walls, metal surfaces, stainless steel surfaces, glazed porcelain, glazed ceramic tile, plastic surfaces, shower stalls, sink tops, toilet bowls, metal, sealed granite, sealed marble, plastic, chrome and vinyl, windows and mirrors. It's also safe on washable, hard, non-porous surfaces: enameled surfaces, painted woodwork, Formica, and exercise equipment...and is safe for the acrylic surfaces of tanning beds. The Lucasol XTRA-LIFE SPRAYER has a chemical resistant piston bushing and over-size piston provides a longer life without leaks. The Lucasol XTRA-LIFE Trigger Sprayer outlasts 4 discount sprayers! Mix 2 ounces with a gallon of water for disinfecting strength. Mix 2 ounces with 3.5 gallons of water for sanitizing strength. 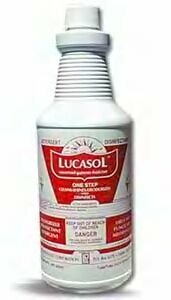 Lucasol One Step Hospital Grade Disinfectant Kills 99.999% of bacteria, viruses, and fungus in 60 seconds. 100% kill rate in 10 minutes. Most effective, least cost per ounce product available in the beauty industry. 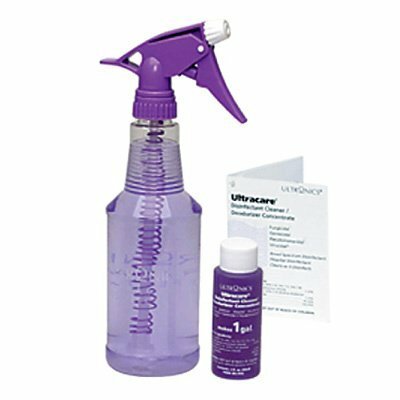 For use on nail implements, pedicure spas, combs, shears, tanning beds, massage tables and any other hard surface which needs disinfecting or sanitizing. Mix 2 ounces with a gallon of water for disinfecting strength. Mix 2 ounces with 3.5 gallons of water for sanitizing strength. 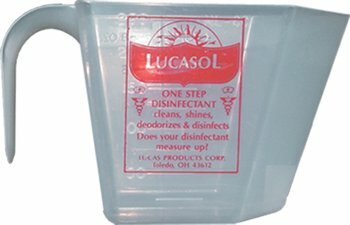 For accurate measuring of larger quantities of Lucasol "One Step" Disinfectant Spray.